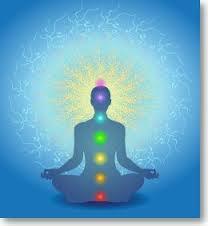 In Hindu thought, kundalini refers to the psychic or cosmic energy that lies dormant in most people. It is sometimes identified with Shakti, the Great Goddess who is equated with divine energy. When dormant, the kundalini is said to lie coiled like a snake (kunda means coiled) at the base of the spine, but it can gradually be raised upwards through the spine using meditation techniques including postures, purification practices, ritual gestures and regulated breathing. 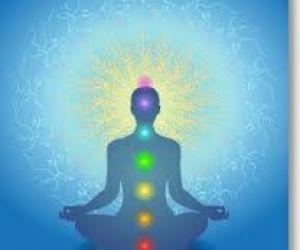 This process of raising the kundalini, called kundalini yoga or laya yoga, is considered physically and psychologically beneficial throughout, but the ultimate goal is to induce the kundalini to rise to the top of the spine and into the brain. This is said to result in union with Shakti (divine energy) or atman (the cosmic Self), which is accompanied by an extraordinary state of awareness and bliss. Each chakra is associated with a different set of psychic powers and spiritual experiences. For example, accessing the vishuddha chakra in the throat bestows powers of telepathy and prophecy, while activating the ajna chakra on the forehead brings universal knowledge. Specific colors and sounds are also associated with the chakras and used to activate them.